Thin porous binder-free layers of Co hydroxide/oxide for electrochemical capacitors were formed by dealloying an electrochemically deposited binary Zn–Co alloy, consisting of single homogeneous γ-Zn21Co5 phase. Scanning electron microscopy with energy-dispersive X-ray spectroscopy and X-ray photoelectron spectroscopy (XPS) was used to assess the structure, thickness, and distribution of elements in the as-deposited alloy and the dealloyed layers. The most developed porous layers were formed at a dealloying potential of − 0.965 V versus Ag/AgCl. Both the as-deposited Zn–Co and the dealloyed layers were characterized by a relatively uniform distribution of the components. As determined by XPS, the top of the dealloyed layers before cycling consisted of Co(II) hydroxide with traces of Co(0) and Co(III). 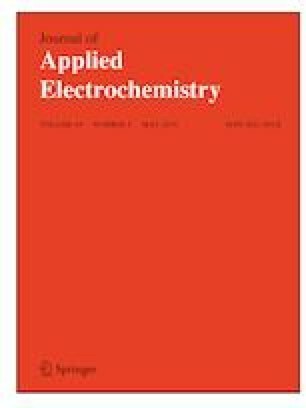 The capacitive properties and stability of the formed layers of porous Co oxides were assessed using the electrochemical cyclic voltammetry (CV) and the constant current charge–discharge (C–D) methods. The areal and volumetric pseudo-capacitance values of ~ 0.38 F cm−2 and ~ 880 F cm−3, respectively, were calculated for a 4.3-µm-thick layer. The stability of the studied Co hydroxide/oxides layers was evaluated by CV and C–D cycling. After 300 cycles of C–D, the retention of pseudo-capacitance ~ 80% and the Coulombic efficiency of ~ 98% were determined. The long-term pseudo-capacitance retention was estimated at ~ 78.3% of the initial value. The assistance of S. Stanionytė in XRD measurements of the deposited and the dealloyed Zn–Co layers is greatly acknowledged. This research did not receive any specific grant from funding agencies in the public, commercial, or not-for-profit sectors.